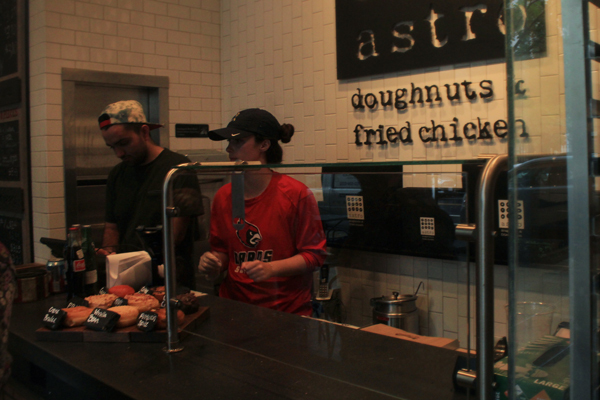 Astro Doughnuts & Fried Chicken offers special fall-flavored donuts this month. Parents’ weekend coincides with cooler temperatures and fall foliage in the District. Take advantage of the crisp air that’s still warm enough to bear with these quintessential fall activities. Foodies have lots of options in D.C. year-round, but be sure to try the fall-themed options at this District staple. If you can’t fit apple picking into your schedule this fall, make time for Astro Doughnuts & Fried Chicken’s October flavors. For the coffee lovers, Astro offers a Coffee Chai Latte doughnut topped with chopped chocolate covered coffee beans. And of course, they also have a Pumpkin Spice doughnut with pumpkin and spice glaze and candied pumpkin seeds on top. Biergartenhaus is one of the most popular German restaurants in D.C., with a reputation as a taste of Bavaria on Capitol Hill. The restaurant has two floors and three outdoor bars. History and Hops is the meeting place for two of life’s greatest pleasures: beer and D.C. history. The Heurich House is the former home of famous D.C. brewer, Christian Heurich. Become one with nature and have your pick off an extensive list of German beers. The Wunder Garten is a fully outdoor bar with tents and umbrellas in case of inclement weather. D.C. unfortunately isn’t exactly known for it’s abundance of farms, but we are lucky to be close to the great states of Maryland and Virginia. If you’re willing to go the end of the Metro line and then hop in a short Uber ride, there is nothing quite like a hand picked apple, running through a corn maze or fresh cider. Summers Farm gained notoriety when they made a Taylor Swift corn maze last year, but the folks at Summers are more than just Swift fans. They have an impressive pumpkin patch, snacks, apple and pumpkin blasters, hayrides and authentic country charm. Gaver Farms is a charming family-owned farm nestled in Mount Airy, Md. Gaver Farms boast 12 acres of pumpkin patches and visitors can take advantage of a free hayride to pick pumpkins. You can even pick your own Fuji, Cameo, Gala and Empire apples. Don’t leave without some apple cider and apple cider doughnuts from the farm market. This article appeared in the October 10, 2016 issue of the Hatchet.